Ergonomically shaped handle reduces strain on wrists. Deluxe scorecard holder with storage compartment. High Modulus ultra lightweight aluminum tubing. Simple one step lift and fold strap. Patented one step quick fold system. Center foot brake locks both rear wheels in one step. Easy rolling lightweight non-flat 12" tires. Quick release bicycle-style wheels with steel ball bearings. Deluxe scorecard holder with storage compartment and beverage holder. No need to bend down or touch the front wheel to fold cart. Amazing one hand folding system. Extremely lightweight cart folds flat for easy handling and storage. 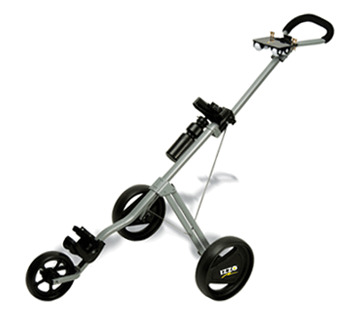 The ATC offers golfers a three wheel option at a value oriented price point. ATC features include a removable front wheel, hill brake, ergonomic handle and rainproof score card holder.